Hello again and welcome back to Shoalhaven Diesel Tech Nowra Speedway. Over the years this track has gained an enviable reputation, for consistent and brilliant quality racing surfaces, for popularity with the drivers who drive here and for being the most spectator-friendly venue around. Last season was a huge success with the new committee showing what enthusiasm and commitment can do and they are looking forward to doing it all again, only better. Racing takes place over the Summer with big meetings planned for the holiday season especially, to entertain both the locals and the many visitors who holiday here in the Shoalhaven region. Nowra Speedway would like to thank all of their sponsors for making it happen. As well we look forward to welcoming back all the volunteers who help us bring you quality racing each fortnight; without them we would not be able to do so. 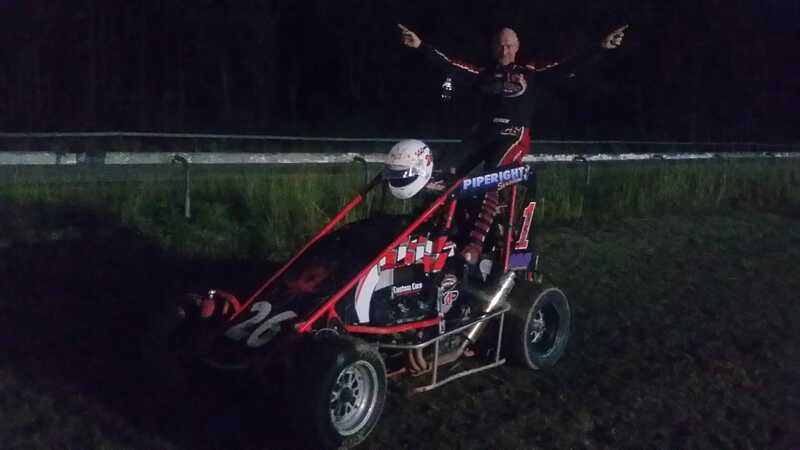 Mark Heaton (NSW) is the new Australian #1 in compact speedcars after a dominating performance last night. He started from pole as the top pointscorer for the evening and led the 25 lap feature race from start to finish, never being seriously challenged. The 25 lap race went flag-to-flag without a stoppage and Heaton defeated the defending champion, Justin Paull (Vic) and rookie driver Ayden Elliot (NSW) to claim an emphatic victory. Mark becomes the first NSW driver in 19 years to win the Australian title for compacts. Congratulations, Mark from all of us here at Shoalhaven Diesel Tech Nowra Speedway. This Saturday night, 20th April (Easter Saturday) , will be our final meeting for the season and we have saved up the best for last. AMCAs, RSA 4 Cylinder Sedans, Western Sydney Street Stocks, GP Midgets AND the Australian Title for Compact Speedcars. Gates open at 4, racing starts at 6, don't miss it. LATE NEWS: The Test and Tune Day has been postponed. Stay tuned for details of new date. Sadly tonight's meeting (23rd March) has been cancelled due to extensive flooding in the pits and on the track. Well, the 9th of March was a cracker and we're racing again this weekend, the 23rd March. On the card will be AMCAs, Compact Speedcars, the booming V8 Super Sedans, plus the two fastest divisions to hit the speedway, Lightning Sprints AND F500's on the one programme. As well we will have the Vintage Sprintcars featuring a very special guest driver from the USA, Kirby Wood who still races regularly at Knoxville. You owe it to yourself not to miss this one. Don't forget to make it to the track this Saturday night, as well as the NSW Title for GP Midgets we will also have the AMCAs, Wingless Sprintcars and the Scorpion Cup for Street Stockers, don't miss it. You asked us about a Demolition Derby and tonight we deliver. Don't miss the show as well as a full card of sedan and open wheel racing. This Saturday night, 23rd February 2019. Be there! A huge thank you to everyone who helped make our 19th January meeting a big success. You certainly helped us prove that, even if we get knocked down, we get back up and fight on. This Saturday night, 26th January, come and help us celebrate Australia Day with a feast of racing featuring Litre Sprintcars, Modlites, Wingless Sprintcars, RSA 4 cylinder Sedans, Speedway Legend Cars and the wild Western Sydney Street Stocks. We thought that the washout on the 5th was bad but nothing could have prepared us for what track staff found when they arrived here on Monday morning. Vandalism and destruction on a huge scale, with almost every bit of plant and equipment being either stolen or destroyed. We estimate that at least $50000 worth of damage was done. BUT, and here’s the big but, thanks to the generosity of race fans all over NSW AND many local businesses, not only are we NOT closing but we WILL ready to bring you another cracker of a meeting on the 19th, this Saturday. We may have been DOWN, but we are not OUT. A big thank you to our hard-working club and their amazing volunteers for getting us back up and running, we couldn’t have done it without you. And to everyone who has offered money, help, time and equipment, we just can’t thank you enough. If you know anything about the break-in and vandalism we urge you to contact CrimeStoppers and if you want to donate to the cause of replacing all our gear and keeping us running, please do so by depositing to our bank account. Nowra Speedway Account - Bendigo Bank. Please ensure that you include a reference with your name or your business name so we can thank you properly. Sometime in between Saturday night and Monday morning, vandals broke in to the speedway complex and trashed the place. They have either stolen or destroyed upwards of $50000 worth of equipment including most of the canteen hardware, the PA system and contents of the Control Tower. One of our little Suzuki fire trucks was driven into the dam and the other was driven away from the complex and was burnt out. Considering that quite a lot of our equipment has been donated over the years and that replacing it will be exceptionally difficult, we are just not sure how we can proceed from here. Most of all, if you have any information that could lead to the arrest of the people concerned, please contact Crime Stoppers as soon as you can. We support numerous charitable organisations in the area and it is they who will feel the loss the most. Please help if you can. Saturday night's meeting (the 5th of January) is the 2nd of the new 2018-2019 season. It will feature Compact Speedcars, Modlites, GP Midgets, RSA 4 Cylinder sedans, Vintage Sprintcars and a huge 4 cylinders-only Demolition Derby, don't miss it. The Speedway contact telephone number has been changed. It is now 0401 663 930. Competitors please note that, for ease of administration and to ensure that your entry is both accepted AND appears in the programme, ALL nominations must be in by the Sunday prior to the race meeting!